Centaurea gymnocarpa is endemic to Capraia, a small island of the Tuscan Archipelago. This species colonizes the cracks and the fissures of cliffs made of acidic rocks (habitat 6.2: Inland Cliffs Rock Pavements and Outcrops). It is found in association with other local endemic species such as Linaria capraria, Silene badaroi and Galium caprarium. C. gymnocarpa is a perennial herbaceous plant with a woody base and a long stem, which grows up to reach 80-100 cm tall. It is covered with dense short hairs which confer a greyish-white color to the whole plant. The leaves, more or less fleshy, are green above and greyish-white below, and many old leaves persist at the base. Its tiny pink flowers are gathered together in a compact flower head. Flowering occurs in May. C. gymnocarpa belongs to a species complex known as the “cineraria” group. 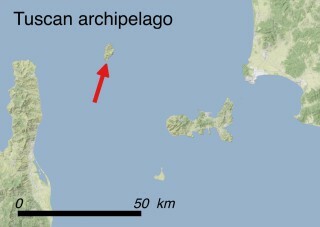 This group probably derives from a single common ancestor which was more widespread along the coasts of the Tyrrhenian area. 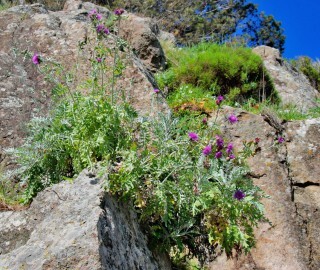 Afterwards, along with the disruption of land masses, several closely related species of Centaurea evolved separately on isolated rocky seaward cliff habitats. Using a 2×2 km grid, the AOO is 16 km2, and two locations can be found. This species has been categorized as VU (Vulnerable) according to IUCN Red List Criteria D1 and D2 (Number of mature individuals <1000; A00 <20 km2, two locations). According to available information there are 8 subpopulations, and the EOO coincides with the island’s surface. The risk level of the species was downgraded because an increase in the number of individuals has been recorded with respect to the 2005 assessment, so that the Criterion B cannot be applied anymore. Moreover, during the years 2013-2014 the alien invasive plant Carpobrotus acinaciformis, whose competition was the main risk factor for C. gymnocarpa as reported in the previous assessment, was finally eradicated from the area between Porto and Paese, and subsequently an increase of established seedlings in the subpopulation located between Porto and Paese has been recorded. As for the other sites, no recent data are available. On the other hand, the second most invasive alien species, Senecio angulatus, is performing a fast expansion in the area around Paese (threat 8.1.2: Invasive non-native/alien species - Named species), and the increase of tourism (threat 1.3: Tourism and recreation areas) could in turn enhance the risk of intentional harvesting of the flowers of this beautiful plant (threat 5.2.1: Gathering terrestrial plants - Intentional use). Legally: This species is protected by the Regional Law 56/2000, aiming at the conservation of the biodiversity in the Tuscan region. 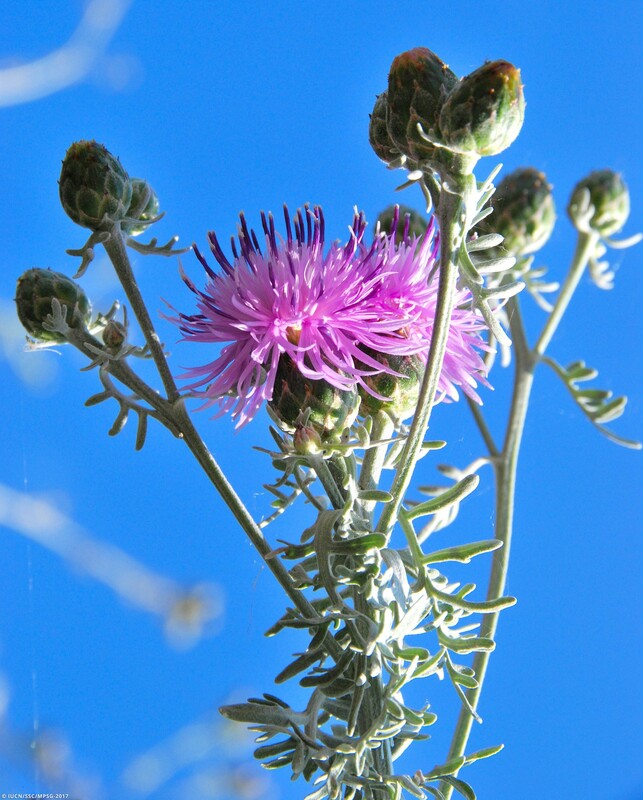 According to this law, it is forbidden to collect any species belonging to genus Centaurea. In situ: Four of the eight known subpopulations occur in the Tuscan Archipelago National Park, which includes a protected terrestrial area of ca. 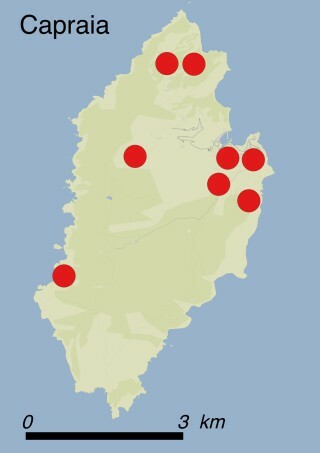 18,000 ha; some of them grow in the Natura 2000 site IT5160006 ‘Isola di Capraia - area terrestre e marina’. The eradication of Carpobrotus acinaciformis was carried out by the company Nemo Ambiente in 2009 through a project funded by the Province Administration of Livorno. This alien species was successfully removed on the whole island with the exception of the less accessible areas. Ex situ: The species is cultivated in the Botanical Garden of Florence. Senecio angulatus should be eradicated manually to avoid any damage to the other co-occurring endemic and/or rare plants in the location near the main road connecting Porto and Paese. Additionally, to prevent the tourists from picking the flowers of C. gymnocarpa, adequate fencing should be done, together with initiatives aiming at informing local people and tourists about the importance and rarity of this species. Bruno Foggi, Department of Biology, University of Florence, Italy. Fabio Guidi, Capraia ; Mario Mannocci, Gruppo Botanico Livornese and Museo di Storia Naturale del Mediterraneo, Livorno, Italy.